If you haven’t already, please check 1-5 on How to get started first - to eliminate any software or system issues and to familiarise yourself with registration and uploading your images. How do I create my first Photo Book? The next window will show you the various photo book products and sizes. 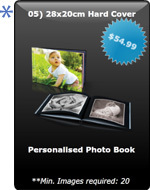 For this offer Select the Photo Book of your choice *see sample image at right. Upload your images and Select Image/s or drag from 'loaded' to below the 'Selected' line then select > Continue. Next use the editing tools to make any adjustments and create your Cover Design. Review your order and Accept > OK and Click >Done. Can I change the style of photo book once I have started my project? Once you have started a project you cannot change the layout/style of your photo book. If you go back to the start of your project to change the size or style, you will lose the progress of your project. As you are unable to start again you will need to go back to the start and create a new book. Can I order the photo book I have created in different sizes once I have completed my project? Unfortunately it is not possible to recreate a project you have already saved in a different size or style. If you would like to change the size of your photo book, you will need to create a new project. Can I upload and add more photos to my photo book after starting my project? Once you have started your project, you can click the 'load more' button and follow the prompts to upload and add more images to be used in your project. How do I add text to my photo book? Open your photo book project. Click on the text tool in the toolbar on the left of the work area. "Add text" will appear on the page, surrounded by a blue border. You can also change the font style, colour and alignment as required. You are able to change the size of the text by clicking on the “25” button on the left tool bar and then using the + and – button. If you decide that you do not want to keep the text on your page, select the text by clicking on it once, then click the delete button. To move the text box around the page or to the opposite page (left) you need to click on the red position box on the left of the page. Once this has been done you can click inside the text box and drag it to the position you would like. How do I change the background, embellishments and borders in my photo book project? Click on the "backgrounds/embellishments/borders" button from the menu at the top of the work area. Backgrounds/embellishments/borders are grouped by category. Select a category of background from the drop-down menu. Select the backgrounds/embellishments/borders you would like to use from the carousel, then click and drag the background onto the correct page in your photo book project. In the backgrounds/embellishments/borders options window, a pop up window will appear where you can select which pages you would like to apply the background to, then click OK.
How do I add more pages to my photo book? Click on the "Manage Pages" button at the bottom of the screen. Select the page after the page you would like to add by clicking on it once. To add in extra pages to your book, you will need to click on “Manage Pages” on the design page. This is displayed at the bottom of the page. Then you will need to highlight where you would like to add in the extra pages, and then click on “insert" until you have the required pages that you would like. Follow the same steps to delete pages however select the delete pages button instead of the insert button. How do I arrange pages? To move the position of your pages you will need to click on “Manage pages” on the design page. This is displayed at the bottom of the page. You will then need to highlight the page you wish to move and then use the arrows on the left hand side menu to move the pages to either the left or right of its original position. Please note however the pages are a double spread and therefore both pages will move. You cannot select only one of the pages in the double spread to be moved. How do I remove borders? To remove borders click on the actual border on your image, not the photo as this will delete your image. Once you have clicked on the border click "borders" at the top like you did to get them. In there, click "no borders". This will then show you a very light grey box in the space at the top. Click on that "no border" and drag it onto your image again. You will then be asked if you want to remove it on just that image or the entire book etc. Having problems with your project? Most of our customer support is helping people to have the best user experience from their individual computers. If you have forgotten your password, please click on the "Forgot my password" link on the sign in page. Enter your email address, and you will be sent a confirmation email with your new password information. If you do not receive an email, check your spam or junk mail folders. The yellow exclamation mark or a red cross mark are warnings that the image that you have used for your photo are of a low resolution, which may give poor results when printed. The yellow mark is a low-resolution warning and the red cross indicates not to use the image at all. We strongly suggest that you do not proceed with your order if these warnings appear. To continue with your order, either reduce the size of the image until the warning disappears or try uploading a larger size image. Please be warned if you proceed with your order and these warnings were displayed it voids any opportunity to obtain a refund for bad quality images. For this reason please make use of our contact methods for advice before placing your order. Once your order has been submitted, it uploads directly into an automated processing system. Once your order has been placed, it is unfortunately not possible to make any changes to your order. Please take the opportunity to fully preview your order and contact us with any questions prior to submitting your order. How do I see the progress of my order? Click "Sign In" and enter your email address and password. The current status of your most recent orders will be displayed. In Progress - Your order has been received by our system and the printing lab is processing the information. In Production - The printing lab has received your order and is currently printing and producing your items. Shipped - Your order has been packaged and posted from the printing lab. Received in store - Your order has been received at the store and is ready to be picked up. A confirmation email will be sent to you to confirm that your order is ready. We use Adobe Flash technologies to run our site, and Apple restricts the use of this technology on all their mobile devices. You can read more about the reasoning behind this via the below link. http://www.apple.com/hotnews/thoughts-on-flash/ You will need to place your order on a full sized computer, laptop or Mac. Sign into the website using your email address and password. Click on the “My Photos” button. Select an album to upload your photos into. If you do not have an album, you will need to create one and name it. Click the "Upload Pictures" button in the bottom right hand corner of the main menu screen. Select an Image up loader to use and click OK. If you select the Aurigma up loader, a message may appear at the top of your browser that states: "The website wants to install the following add-on" click on the message and select "Install ActiveX Control" (for Internet Explorer). Follow the instructions given to install the software. You may need to log back in to your account. When using the Aurigma uploaded, you will also have the option of choosing an upload quality. Select an” Image Quality” option, and click OK. If you would like to order large items such as canvas prints, we recommend using the large “Image Upload” option. You will then be able to select the location on your computer from which to upload your photos. i.e. My Pictures. Select the images that you would like to upload, and click the "upload" button. Your photos will now be uploaded to your album. Do my photos get resized automatically during upload? There are 3 different upload options available. Small - Suited for small gifting items. Medium - Suited for regular prints and some enlargements. Large - Suited for large prints and canvas. The image will be resized based on your selection. By choosing a smaller upload option, the upload speed will increase, however the image quality will be reduced. You only need to use the upload size based on what you are planning on ordering. The quality of the image will not be increased by choosing a higher upload option. There are a number of reasons why you may not be able to upload your photos using a Mac computer. If you are using Safari as the Internet browser, we suggest you try using Google Chrome as the browser instead. Safari can be problematic and should be the first thing to check if problems have been encountered. How do I check photo quality? If you go to the main page once you have logged in you will see an icon in the top left corner that says my photos. If you click on that it will take you to where your images are stored. Select the album you want to work with and once you have it opened you can select any photo by clicking on it and then preview above. This will give you an indication on the coloured meter whether your image is suitable to use or not. How do I edit/crop my image or change to black and white? From the design page select the image you would like to change and then click on “Edit” on the menu on the left hand side. Select black & white to change your image and then continue if you are happy with it. Note you can also select sepia as well. To crop your image select the crop box on the left hand side and move the arrows accordingly. Again, click continue to save the changes or previous to leave the editing page. What format do my photos need to be to upload? Any digital photo you upload must have an ending that matches one of the above file types (e.g., beachholiday.jpg). Whichever type of file you use, the copy you upload will be converted to JPEG format before it is added to your account. When you are using the Aurigma Uploader you are only able to upload files in JPG or PNG file formats. The Imagine Uploader accepts JPG, PNG, GIF, TIFF, BMP or PSD files. Why can't I see file extensions on my photo files? From your computer desktop, click 'Start' and select 'Control Panel' from the menu on the right. Click on the 'View' tab at the top of the window. Uncheck the box labelled 'Hide extensions for known file types' and click on the 'OK' button to confirm your change. You should now see the file extensions at the end of all file names. NOTE: These steps may vary slightly if you have an older Windows operating system. Click on the 'Finder' drop-down menu at the top of your browser window. In the next window, select the 'Advanced' icon. Check the box next to 'Show all file extensions'. There are a number of reasons why you may not be able to upload your photos using a Mac OS computer. Click on the Apple menu in the top left hand corner of the screen. Remove checks from everything except cache. Leave cache checked. Click Clear Private Data Now.